An avuncular character actor, usually in sympathetic roles, who represented the average, decent 'man on the Clapham omnibus', who became a film star of the Clement Attlee era (1945-51), often playing policemen and honest, dependable working-class fathers, and British audiences could easily identify with his aspirations. He also had a nice line in film villains, who were all the more shocking because of his image. Warner (born Horace John Waters in Bromley-by-Bow on 24 October 1896) was in the Royal Flying Corps in WW1, and from the '20s in variety as a comedian, delivering comic monologues - his sisters were variety performers Elsie and Doris Waters . His film debut was in a variety theatre mystery, The Dummy Talks (d. Oswald Mitchell, 1943), and he soon became an Ealing regular, with good roles in Hue and Cry (d. Charles Crichton, 1946), as leader of a gang of crooks, and in Against the Wind (d. Crichton, 1947), as the traitor shot dead by the French resistance heroine. One of his best villains was as a hardened escaped convict chained to young George Cole in My Brother's Keeper (d. Alfred Roome, 1948). But he will always be remembered for two roles. First was London bus driver Joe Huggett, representative of the steady, reliable working man, on a family holiday at Holiday Camp (d. Ken Annakin, 1947), in which Warner and Kathleen Harrison , described by one critic as 'South London's answer to Ma and Pa Kettle', captured the spirit of post war Labour Britain - 'making do' and generally promoting the wartime egalitarian spirit in peacetime. Three more Huggett films followed, as well as a long-running '50s radio series on the BBC Light Programme, all presenting an idealised version of working-class family life. Second, in The Blue Lamp (d. Basil Dearden, 1949), Warner played the fatally heroic P.C. 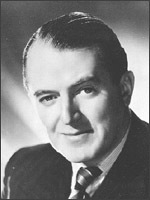 George Dixon, a character so popular that he was revived by Ted Willis for BBC television in Dixon of Dock Green (1955-76). It presented a reassuring, nostalgic world where young thugs see the error of their ways after a homily from fatherly PC Dixon, who matured into the oldest serving constable in the country. In The Ladykillers (1955), he was at the police station desk again, reassuring little old Katie Johnson . But for most of the '50s, he was in supporting roles, often in domestic settings, as in Home and Away (d. Vernon Sewell, 1956), which repeated the Huggett formula. His last starring role (following TV popularity as Dixon) was as the police inspector in Jigsaw (d. Val Guest, 1962). He was awarded the OBE in 1965. Jack Warner, Jack of All Trades: An Autobiography, 1975.